Nordic Pure has been manufacturing air filters since the 1960's. 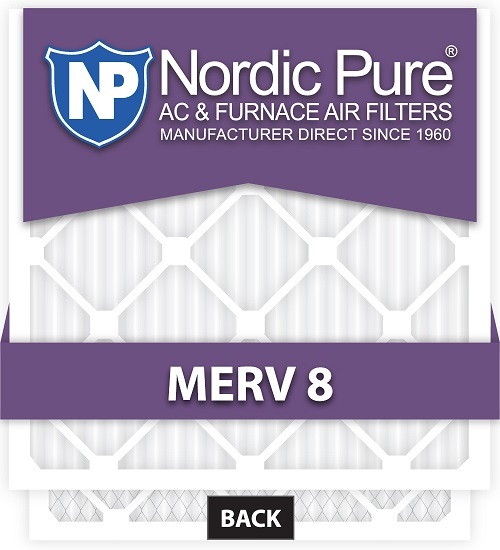 MERV 8 air filters are a good upgrade from the standard disosable filter supplied by heating and cooling equipment manufacturers. MERV 8 air conditioner and furnace filters capture 70-85% of airborne particles 3.0 - 10.0 microns in size. Particles representing this size range from household dust, hair spray, mold spores, dust mites, pollen, and carpet fibers. These air filters have a nominal size that is in whole inches. The actual size is a fraction smaller. The nominal 1 inch thickness is actually 3/4 inch. These Filters Are Sold In Cases of 6 Filters. Price is for a case of 6 filters.